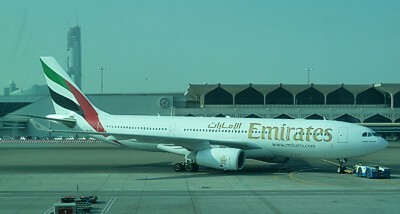 This information is intended as a guide, but for up to the minute timetables, please consult Emirates at www.emirates.com. 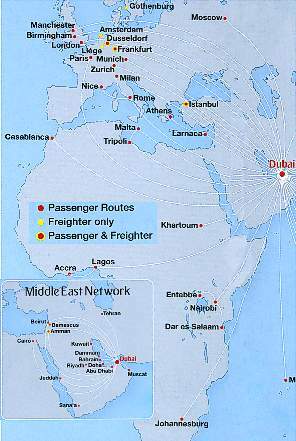 Emirates Airlines' main base is at Dubai, or DXB. The new airport here is the hub of Emirates operations. Partly for historical reasons, and partly because it is so unbelievably hot in the day, most flights connect here in the middle of the night. This has great advantages for the aircraft (they work far more efficiently when it isn’t 50 degrees outside) but woeful for the passengers, and between 3am and 5am Dubai Airport turns into a kind of demonic zoo, with sleep deprived passengers lying down end to end, and with standing room only in some of the premium lounges. Fun, it is not. Emirates also takes the short hop approach with some of its routes, stopping off rather like a bus trip to let on more passengers, so some flights can take a lot longer than you planned, and take you to airports you never knew you wanted to go to. Most airlines abandoned this practice in the 1980s, but for Emirates it is the way to go, and you need to check carefully on booking to see if your direct flight really is direct. From London LHR there are five direct flights to Dubai every day. The first is at 0840, arriving at 1830 on a 777-300. This is the only real daytime flight, but it is blighted by the poor seats in economy (however it is very popular with the bucket and spade holiday maker brigade). The afternoon flight is the 1415 on the A380 which arrives at 0005. It tends to be the daily mainline flight to link to Australia, and is often chocka, because the overnight connection here is a just tolerable late at night. Not so lucky is the daily 1700 arriving 0250 on the 777-300ER (unpopular thanks to its very early morning arrival), and 2040 (arriving 0630) on the Airbus A380-800, which is the flight most passengers want, particularly in economy, thanks to the larger seats on the Airbus. Alas, with a flight time of under 7 hours, you'll probably only manage 3 hours sleep on this. Finally, Emirates has added a fifth daily flight, leaving Heathrow at 2215, arriving at 0805 on a Boeing 777-300. London Gatwick also has three direct flights to Dubai every day except Wednesday and Thursday at 1000 (arriving 1950) on the unpopular Boeing 777-200, the very popular 1425 (arr 0015) using a 777-300ER, and 2115 (arriving 0705). Manchester has daily direct flights to Dubai, with three a day, all using very different aircraft. Choose carefully if you want an aircraft with good seats. There is a daily flight at 0940 (arrives 2000) on an A330, the wildly popular 1410 (arrives 0015) on the A380 and 2100 (arrives 0705) on a Boeing 777-300ER. Birmingham also has a Boeing 777-300ER to Dubai at 1415, and a second daily flight at 2120. Australia is less well served by Emirates than it once was. Sydney now only has two flights a day: only one direct, and one via Bangkok. Emirates third daily flight is a bit of an unknown quantity, being launched, cancelled, and re-launched in the space of a year. Seven days a week there is an A380 which departs Sydney at 2110, arriving 15 hours later into Dubai at 0545. This is a really long flight – but it can be worse Arriving into Dubai at the same time, but leaving Sydney three hours earlier at 1845 is a flight which goes via Bangkok on a 777. True, this flight breaks up the journey into 9 then 7 hour segments, but considering it leaves Bangkok at 2:40am, and is on the dreaded Boeing 777-300ER (with very narrow seats in economy) it is to be avoided at all costs. Emirates have tried, and failed, with a third daily departure. It has now been re-launched again. This is the daytime Boeing 777, but this time the 777-300ER version (it was the rare 777-200LR at launch) at the exceptionally early morning 0600 departure from Sydney which lands in Dubai at 1430. This was brilliant for a connection to London, as you can virtually walk straight onto the 1545 to LHR, arriving at 2015 - all in the course of one day, which gave a flight from Sydney to London with no overnight flights. Pity no one wanted to fly on it, and it was abandoned within a year. It may last a little longer in this reincarnation. 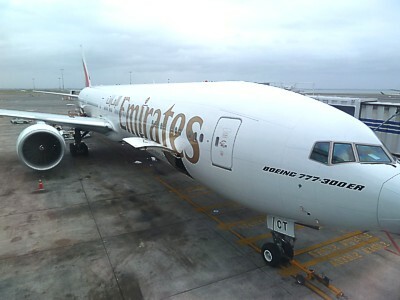 Emirates flies from Melbourne to Dubai three times a day, two of which stop off en-route. There is the 0235 (arrives 1300), 1800 (arrives 0450) and the only direct flight of the day, the 2125 (arrives 0540), all on the Boeing 777. There are Emirates flights from Brisbane to Dubai at 0230 (arrives 1245) stopping off en-route, and a direct flight at 2045 (arrives 0525 direct). In reverse from Dubai Brisbane has a direct A340-500, which leaves Dubai at 1025, arriving at 0640, which is a much much better flight, particularly in economy. Perth has a daily direct 777 at 0235, landing at 1710. From Dubai Bangkok has three daily directflights using a 77-300 at 2300 (arrives 0820) and 0315 (arrives 1225) and an 777-300ER (with the new First Class) at 0850, arriving at 1810, both of which carry on to Hong Kong which gets its own direct flight on Monday and Wednesday at 0320 on an A330. From Dubai there are flights on a 777-300ER to Singapore at 0245 (Arr SIN at 1405) which carries on to Brisbane, (arrives 0040), before finally leaving for Auckland at 0800 arriving there at 1355 (an exhausting 21 hours later). There is also a daily flight at 0245 (arr SIN at 1350) which leaves again at 1500 every day apart from Sunday to hop to Melbourne arriving at 0110, leaving there at 0935, arriving in Auckland at 1500 (an incredible 28 hours later). This flight, on a cramped 777, is not recommended. 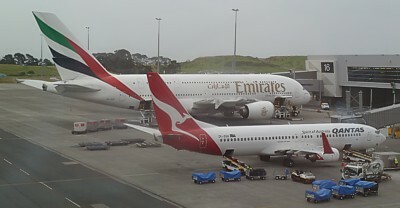 Christchurch also gets a flight 3 times a week from Dubai via Melbourne. Dubai also has direct flights to Frankfurt, Dusseldorf, Paris, Munich, Rome, & Athens. 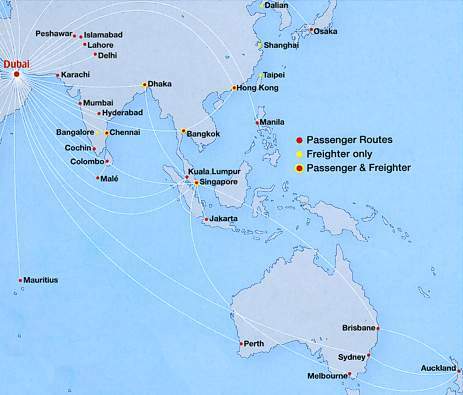 These connect to other direct flights to Dhaka, Mumbai, Mauritius, Manila, and Osaka.